On Wednesday, the “Today” show featured a segment on Thandi, a rhino whose incredible story of resilience has resonated around the world. 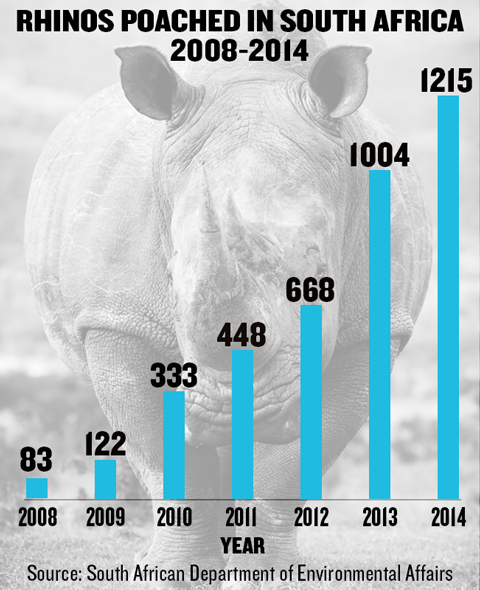 In 2012, poachers hacked off Thandi’s horn with machetes while she was still alive in South Africa’s Kariega Game Reserve. Despite losing part of her face and almost bleeding to death, she recovered with the help of people like wildlife vet Dr. Will Fowlds, who performed a dozen procedures on her over the course of nine months. Then, on Jan. 13, 2015, Thandi gave birth to a calf. Demand reduction — in other words persuading users of wildlife products to stop buying them — is the foundation of WildAid’s mission. As more and more conservationists and researchers realize that anti-poaching forces cannot save wild rhinos on their own, we’ve noticed increased calls for more resources to be devoted to this vital task. • A meeting in Cape Town brought together two ideological camps rarely found in the same room: South African pro- and anti-rhino horn trade lobbyists. In a dialogue described by writer Peter Brochert as “ground-breaking,” the participants from opposing factions put differences aside and agreed to a multifaceted action plan, of which “promoting public education primarily in Asia and worldwide to reduce demand for rhino horn” was among the fundamental goals. • In response to the South African government’s January announcement that a record number of rhinos had been poached in the country in 2014, economist and writer Andrea Taegle argued in an op-ed for the Daily Maverick for the need to better understand the market forces driving the slaughter. Understanding these complex markets is indeed key: WildAid has noted that demand patterns for rhino horn seem to shift rapidly; there is no single reason for consumers to buy it, and reasons can vary from country to country and year to year. • In a Q&A this week on The Huffington Post, The Nature Conservancy president and CEO Mark Tercek spoke with Ian Craig, CEO of the Northern Rangelands Trust, which comprises 27 member conservancies in northern Kenya united to preserve wildlife through community-based leadership. When asked about what’s working and what’s not in anti-poaching efforts, Craig echoed Gen. Jooste’s bottom-line views on the importance of demand reduction. Conservationists convened at Kenya’s Ol Pejeta Conservancy last week for an emergency meeting on saving the world’s most imperiled rhino species: the Northern White Rhino. A close relative of the Southern White Rhino targeted by poachers in South Africa, the Northern White is on the very brink of extinction. Since WildAid filmed the rhino public service announcement below with The Duke of Cambridge (Prince William), Yao Ming and David Beckham in September 2013, the number of Northern Whites has declined from seven to literally just a handful, five, all of which are in captivity. Last year, two of the remaining Northern White Rhinos died within months of each other. Suni, a 34-year-old male, succumbed to a suspected heart attack at Ol Pejeta in October, and Angalifu, a 44-year-old male, died in December at the San Diego Zoo. This leaves three Northern Whites at Ol Pejeta in Kenya, one in San Diego and one in Dvůr Králové Zoo in the Czech Republic, most of which are too old to breed. This likely means that the species can only be saved via yet-to-be-developed technology, possibly a form of artificial insemination of Southern White Rhinos with Northern White embryos, or perhaps cloning. "The battle is to work out what is feasible scientifically in the short time still available to us," Ol Pejeta chief executive Richard Vigne told AFP. 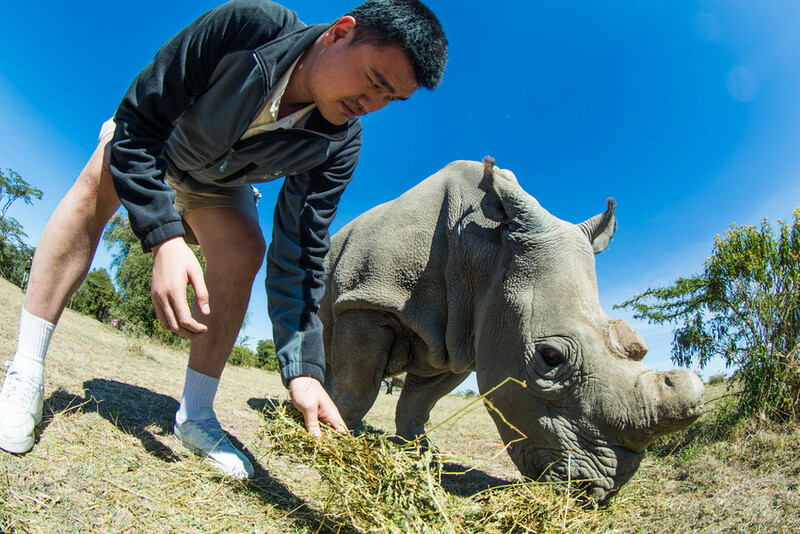 WildAid ambassador Yao Ming traveled to Ol Pejeta Conservancy in 2012 to meet the Northern White Rhinos living there. “It’s tragic to know these impressive animals are among the last of their kind, just because some people believe their horn, which is just keratin like our fingernails, has healing properties,” Yao wrote of the visit. On the anti-poaching front, drone technology, and the targeted use of such technology to help enforcement, is becoming more sophisticated in Africa. A primary player is the University of Maryland’s Institute for Advanced Computer Studies, which has devised analytical models that factor in moon phases, weather, sites of previous poaching activity and other variables to predict with up to 90% certainty where rhinos are likely to be at night, when poachers typically strike. “We crunch the data, and the model tells us precisely where we should deploy our rangers, on any specific night, so they will be in front of the rhinos and can intercept the poachers before they reach the target animal,” University of Maryland visiting professor Thomas Snitch wrote in The Conversation. WildAid applauds advancements in anti-poaching efforts as we work to measurably reduce the demand for rhino horn in China and Vietnam. We have ambitious plans for 2015 to expand our efforts. Our progress over the past two years in Asia is encouraging, but there’s still much more to be done.